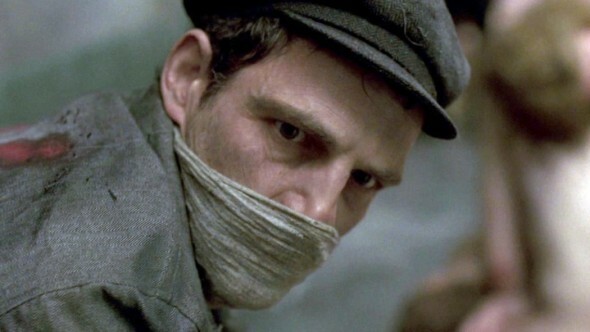 When Son of Saul, Laszlo Nemes’s blistering Holocaust drama, opens, you will think the film is out of focus. Hold tight, because Nemes has made a conscious decision here and this is just the first of many moments that will alter the way you look at a film. The director’s breathlessly confident feature debut, which the Academy has nominated for best foreign language film, closely follows one Auschwitz inmate over a particularly tumultuous 36 hour period of his confinement. If you think you’ve seen everything there is to see about the Holocaust, well, the director will surprise you there as well. Nemes and cinematographer Matyas Erdely keep Saul in shallow focus so that the horror around him is all only glimpsed peripherally. We are focused, as Saul is focused, on just one thing – and yet we are, as he is, saturated in the hell of this existence. When Saul spies the body of a young boy he deems his son, an idea seizes him. He becomes possessed to save the corpse from the knife, find a rabbi to perform a Kaddish (prayer for the dead), and give the child a proper burial. The counterproductive, myopic insanity of this act and the controlled lunacy of Saul’s determination become almost reasonable in the context of the mechanized dehumanization around him – a horror that is immersive thanks to Nemes singular vision and Tamas Zanyi’s suffocating sound design. Much remains ambiguous as the relatively simple story unfolds, but that simplicity allows for the director’s unrelenting focus. It mirrors Saul’s necessary focus, and the moans, screams, beatings, death, and misery that surround him and us – because it is not neatly packaged or clearly articulated – may offer the most realistic picture of the incomprehensible events that any filmmaker could hope to achieve. Son of Saul is a deeply human film about man’s inhumanity to man and Laszlo Nemes is an artistic phenomenon.